This is one of my all-time favorite books to study when I am preparing for a birth. I get asked a lot what book I would recommend if I could only buy one book. Well, this is it! A complete guide, written by a midwife for midwives. An excellent resource for couples who want to take on more responsibility for their birth. Sections deal with: prenatal care; problems in pregnancy; labor and birth; complications in labor; postpartum care, among others. An indispensable book for couples planning to birth unassisted. This book answers all the questions about nutritional and herbal medicine for optimum health during pregnancy. Beginning with God’s design for health and nutrition, the following is covered in detail: how to eat for a healthy baby, which herbs are safe and which are dangerous during pregnancy, and the best ways to minimize those times of nausea and discomfort. Shonda Parker provides information to guide the pregnant mom and her baby to good health with a balanced approach to herbal and traditional medicine. You conceived your child through of love. Why not birth your child the same way? This book is about giving birth privately. It is about changing the way we think about birth. It combines research, theory and personal experience. There are several unassisted birth stories after 1990, including: babies born at 36 and 43 weeks gestation, water birth, Rh- mother, breech twins, unassisted birth after cesarean (U-BAC), first baby a “Do-it-Yourself” birth, fourth generation baby born in the same house. The stories include situations with baby born in amniotic sac, with meconium, and with the cord wrapped tightly around baby’s neck. Babies were born to parents ranging from ages 21 to 44. Collection of fifty stories about unassisted home birth (birth without a doctor or midwife). Couples explain why they chose to birth this way, how they prepared for birth, and shared their joyous birth experiences. Stories include previous C-sections, including one woman who had a C-section in 1946 and had subsequent do-it-yourself births. Parents describe the liberating feelings during labor and birth: no hospital staff telling them what position to give birth in or what to eat or drink. Families share their previous birth failures, frustrations and fears. “This book is an exciting introduction to an area of health care that has wrongfully fallen into disrepute and neglect. It shows how with proper training, common sense, and adequate cooperation from mothers, much suffering commonly associated with childbirth may be alleviated and joy brought into the lives of those who follow Polly’s counsel. I see an increasing need for such counsel, particularly if current trends persist. I eagerly await the sequel to this volume, Polly’s ‘How to’ book.” – Jack Gambee M.D. This title is out-of-print. Published in 1979. 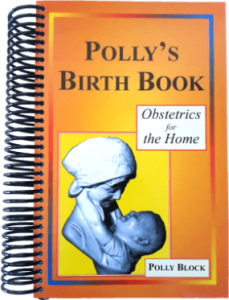 Since 1984, Polly’s Birth Book: Obstetrics For The Home is being used by doctors over the world who are looking to provide natural childbirth to the ever increasing demands of some patients. It is used as the primary training manual in midwifery schools, as a reference book in Childbirth Centers and classes by Certified Nurse Midwives, EMTs and other paramedics. Thousands of parents and Lay Midwives use this volume as a valuable resource for family planning, pregnancy and childbirth, and postpartum care. Polly’s Birth Book: Obstetrics For The Home reflects the twenty-plus years experience of the author as a midwife. You also find there a healthy respect for life and the role of parents as they seek to multiply and replenish. The author was guest speaker at University seminars on childbirth, taught six-day training classes in midwifery in many of the states. She participated in the Carol Sakala research, reported in Content of Care by Independent Midwives, published in the Social Science & Medicine Journal, printed in Great Britain in 1988. It is a well known fact that in disaster situations, Triage rules the day! This means that women will be told to stay home or go elsewhere to deliver their babies because childbirth is not a life threatening emergency! Rightly, the Sheriffs Office wanted to help the layman to become prepared to assist a mother in childbirth. While Pollys Birth Book alone lacks the element of hand-on experience for the reader, it is by far the most sought after childbirth how-to book on the market world over. Polly’s Birth Book is 563 pp, and has 71 illustrations by the author. Another excellent book! The complete guide to informed birth. Practical guide for couples who want greater responsibility for the birth of their baby at home or in a birth-center. Sections on hospital options, cesarean prevention, and emotional aspects of birth. Special sections deal with normal labor and birth, and the most common complications and emergencies, including information on ways to deal with them. This book is out-of-print now, but when it was written in the early 80’s and then updated in the late 90’s, it contained the most comprehensive review of the scientific literature on the safety of home birth and midwifery ever compiled up to that time. It contains the most thoroughly documented set of maternity standards ever published. The author and his wife chose to birth all of their children at home, unassisted. Exposes the lack of scientific justification for many maternity practices in American hospitals and offers viable alternatives – including safe births outside of the hospital. This well-documented book is valuable for parents and professionals alike. The authors birthed all of their children at home, unassisted. (4th edition, 1992). A positive report on children’s presence at birth, with over 125 photographs. This is an important book to read if you are preparing a child to be at the birth of a sibling. There’s information about why and when and how to prepare. And there’s also important information about choices in childbirth, including many of the controversies, things to avoid, and things your doctor might not tell you. It’s very straightforward and factual. If you are planning on having your other children at your birth, it’s essential. It gives very clear guidelines and suggestions on how to handle the whole situation. The birth stories at the end are great because you get to hear what kids actually thought about attending the births of their siblings. Human reproduction, from conception to birth, with outstanding color photographs. Contains many photographs of life before birth including the explosion of the ripened egg, the “winning sperm,” and the first brain cells. Beautiful book. Ina May’s Guide to Childbirth takes the fear out of childbirth by restoring women’s faith in their own natural power to give birth with more ease, less pain, and less medical intervention. Great book, very informative. A classic, even better than her first book! A must-have for every home birth couple, whether you plan to birth unassisted or have a midwife present. You never know if you will be one to labor so fast the midwife doesn’t make it, so its good to be ready with a handy how-to guide. It addresses the most common complications and how to handle them. Written by a doctor for police officers/first responders to keep in their vehicles for those rare occasions they are called upon to help a birthing woman. Anyone working to improve the childbearing experience and help women avoid unnecessary intervention has encountered numerous “obstetric myths” or “old doctors’ tales.” And while the evidence in the medical literature may be solidly, often unequivocably, against whatever “the doctor said,” without access to that evidence, the pregnant woman is quite reasonably going to follow her doctor. This book is an attempt to make the medical literature on a variety of key obstetric issues accessible to people who lack the time, expertise, access, or proximity to a medical library to research concerns on their own. This compact, accurate, yet understandable reference is designed for people without medical training and organized for easy access. A guide to movement in pregnancy, birth, and the postnatal period helps women develop all their bodily resources for labor and birth. Covers pregnancy, childbirth, and the postnatal period: stretching exercises; breathing and massage; descriptions of each stage of labor and delivery; and an up-to-date resource section. Has a chapter dealing with yoga-based exercises. Answers many of the commonly asked questions about water birth. Provides the details of parental and midwife preparation; labor and birth; and danger signals that must be heeded. Includes a wealth of information, personal testimony and instructions for those who choose waterbirth. An irreverent critique of established medical practice by medical doctor; how to guard against the harmful impact of doctors, drugs, and hospital. Covers issues from unnecessary surgeries and prescribed drugs to preventive medicine and home births. A classic. Dr. Robert Mendelsohn, renowned pediatrician and author advises parents on home treatment and diagnosis of colds and flus, childhood illnesses, vision and hearing problems, allergies, and more. PLUS, a complete section on picking the right doctor for your child, step-by-step instructions for knowing when to call a doctor, and much more. My childcare BIBLE! Excellent medical information for the natural-minded parent.